I love this time of the year. Berry season is in full swing and I fully support it. This week blueberries have been on sale and I’ve fully embraced my addiction. This recipe works perfect for a weekend breakfast. Baked french toast is a favorite of ours for Sunday breakfast because I can make it ahead quickly the night before and pop it in the oven Sunday morning. 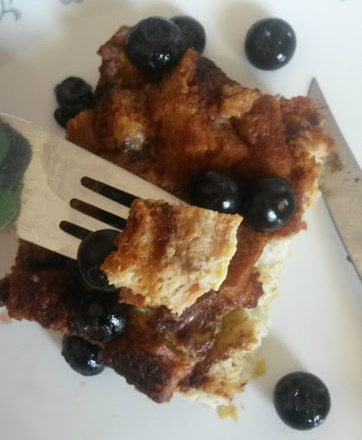 This baked blueberry french toast recipe was amazing! Today’s recipe comes courtesy of Lynn at Turnips 2 Tangerines. I’m highlighting her today as part of the Secret Recipe Club. Lynn is an amazing cook and hails from the great state of Wisconsin. Lightly grease a 9x13 inch baking dish. Arrange the bread slices in the dish. In a separate bowl, stir together the eggs, milk, 1/4 cup sugar and vanilla extract. Pour the mixture evenly over the bread mixture. Press the bread with a spatula to allow the bread to soak up the mixture. Cover the mixture and allow to chill for eight hours or overnight. When ready to bake, preheat oven to 350 degrees. In a small bowl, combine the flour, brown sugar, and cinnamon. Sprinkle evenly over the mixture. Cut the butter into small bite sized pieces and arrange evenly over the bread. Sprinkle the blueberries over the mixture. Bake uncovered at 350 degrees for 25-30 minutes or until a knife inserted into the center of the pan comes out clean. Remove from oven and allow the french toast to sit for five minutes before cutting. Top with blueberry syrup and whipped cream if desired. Note: Because I have food intolerances I did make some adaptations so I could eat it. I used gluten free flour instead of flour and gluten free bread instead of the French bread called for. The recipe posted above is the actual recipe I followed, however my photos came out looking different than hers. To see photos without adaptations, click here. Baked French toast is my go to breakfast whenever we have guests. I love this blueberry version. Perfect for summer! Happy Reveal Day! Nothing better than a french toast casserole to start your day. Looks absolutely wonderful! very nice way to start any day…. 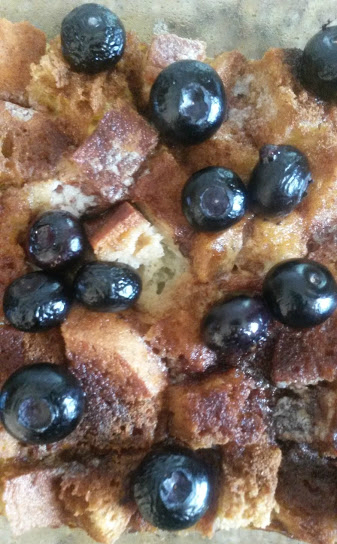 I went back and re-read my recipe for Bake Blueberry French Toast. I did find a mistake in the recipe; the directions should have only included to refrigerate for 8-24 hours..once…not twice. Also the recipe stated to use 3/4 inch slices of bread, not cubes, to cut the butter into the flour, brown sugar and cinnamon mixture using a pastry blender until the butter is the size of small peas and to sprinkle the blueberries on the bread slices first then sprinkle the flour/butter mixture over the blueberries. I am very sorry for any confusion the recipe caused. I only wished you would have emailed me with your concerns before you made the recipe. Love your plump blueberries in the photos! I love french toast. The hubs, not so much. I’ll have to make this on a day off and eat it ALL!! Yum! YUMM!! I love dishes like this and don’t make them nearly often enough – perfect for fresh summer berries! We are LOVING blueberries right now, I have got to make this before this wonderful season is over. Oh this just reminds me that it has been far too long since I’ve made baked french toast. So yummy looking! Love french toast casserole. This version with blueberries looks absolutely delicious! Great pick!